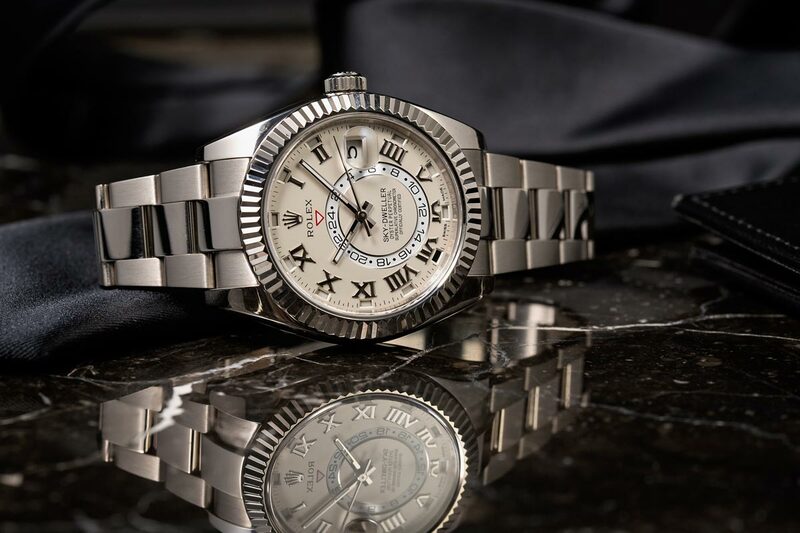 As a watch that features two time zones, a date display, and an annual calendar, the Sky-Dweller is one of the most complex timepieces in the modern Rolex catalog. Since the Rolex Sky-Dweller is fitted with ‘Saros’ (the name of its annual calendar complication) the watch’s date display automatically adjusts for the different numbers of days in each month, and only requires resetting once per year – at the end of February. Well, here we are; it’s now March 1st: time to reset the calendar on your Sky-Dweller! You only need to set the calendar on the Rolex Sky-Dweller once per year. 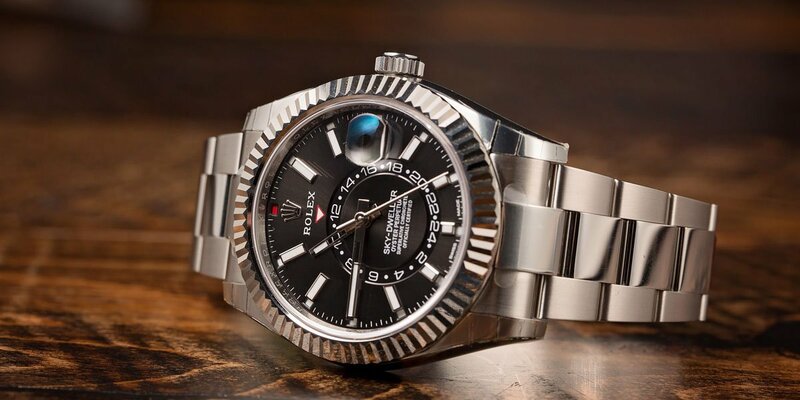 We have covered the Rolex Sky-Dweller extensively in previous articles, so if you are unfamiliar with the watch, read one of our other posts on it for more information regarding its design, its display layout, and how its fluted, ‘Ring Command’ bezel is not just for decorative purposes, but rather it is linked to the Caliber 9001 movement within, and is integral to the functionality of the watch. Instead of discussing the watch itself, we are going to focus on the Caliber 9001, its annual calendar complication, and what you need to do to get your Rolex Sky-Dweller displaying the correct information for the next twelve months. The perfect luxury travel watch for the international business professional. While their names may be similar, an annual calendar complication is not the same thing as a perpetual calendar. Both mechanisms account for the different number of days in the months; however only a perpetual calendar keeps track of leap years. In theory, with a perpetual calendar, you will (almost) not need to ever reset the watch as long as it stays running. Now, this is somewhat unrealistic with a mechanical movement, since variations in timekeeping will require adjustments to be made from time to time; and if nothing else, regularly-scheduled maintenance will require the watch to come to a stop at some point or another; however, the concept of full-autonomy is there. With an annual calendar watch, you will be required to reset it once per year, every year, no matter what. Considering a standard watch with a date requires its calendar to be reset and the end of September, April, June, November, and three times (twice if it is a leap year) at the end of February, the once-per-year schedule of the Sky-Dweller doesn’t seem that bad. All of that being said, you do not reset the Sky-Dweller’s annual calendar at the beginning of the new year like one would expect; instead, you reset it on March 1st. Considering that an annual calendar keeps track of everything except leap years, this makes perfect sense; however it is worth mentioning (and remembering) since it is the only day of the year that you will be required to adjust your watch. Setting the Rolex Sky-Dweller is fairly quick and easy, thanks to its Ring Command bezel. So, now that we’ve run through the basics, let’s get on to how to set the Sky-Dweller. THE RING COMMAND BEZEL – used to select which function on the watch will be adjusted when the winding crown is rotated. The bezel has a total of 4 positions – 0 through 3, with 0 being all the way to the right, and 3 being when the bezel is turned all the way to the left. POSITION 0 – you cannot change the time, day, date, nor the 24-hour GMT disc. Unscrew the winding crown and then pull it out to the first notch. Rotate the bezel to position 1. Set the month by turning the crown in either direction. Cycle through the dates and months until you reach the current month, which is indicated by a contrasting color in one of the 12 windows located around the circumference of the dial: January at 1 o’clock, February at 2 o’clock, etc. with December at 12 o’clock. Set the date of the current month by turning the crown in either direction until the correct date is displayed in the window. Return the bezel to position 0 by turning it clockwise as far as it will go. Rotate the bezel to position 3 by turning it counter-clockwise as far as it will go. The seconds hand will stop, allowing you to set the time to the precise second. Set the hour on the 24-hour disc and the minutes shown by the center minute hand by turning the crown in either direction. Setting the reference time (hour on the 24-hour disc and minutes shown by the center minute hand) also moves the hour hand that displays the local time. For this reason, the reference time must be set before setting the local time. Rotate the bezel to position 2. Set the local time (displayed by the jumping hour hand) by turning the crown in either direction. The 24-hour disc and the minute hand will not move. Only the hour hand moves in one-hour increments. The date changes when the hour hand passes midnight, only in the clockwise direction. Lastly, always remember to always screw the winding crown back into the case after any adjustments to prevent water damage to the movement of your Rolex Sky-Dweller! 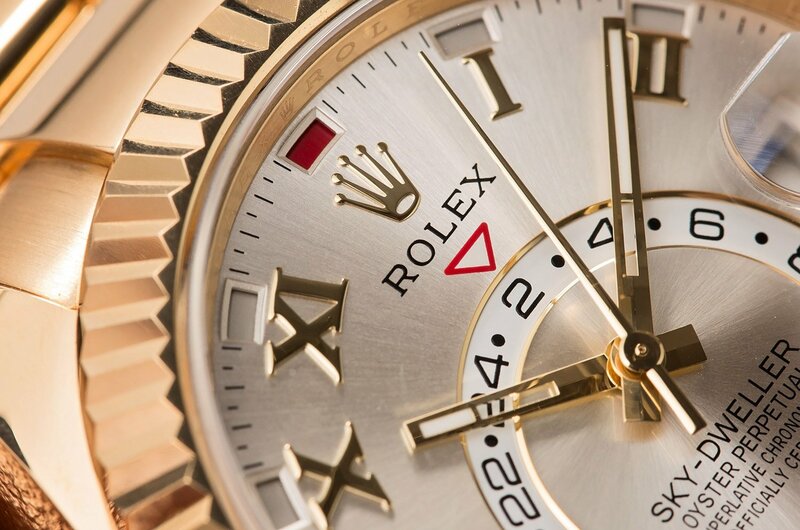 For more info on the Rolex Sky-Dweller, check out our video about the watch (HERE). Now that the calendar on your Sky-Dweller is set, you’re good to go until this time next year!